Juarez Ave. and two sculptures of painter & sculptor Leonardo Nierman. 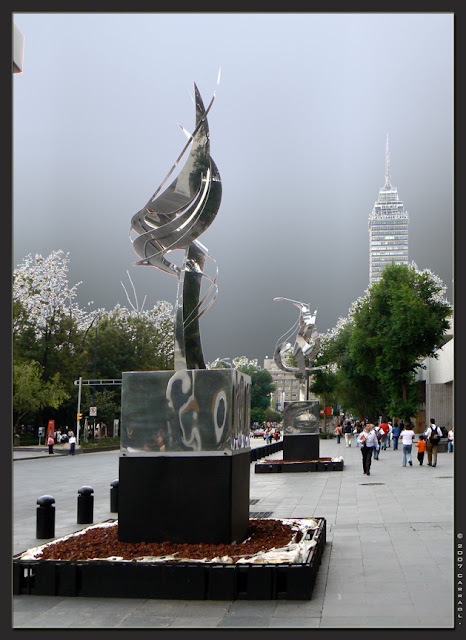 In the background the Latinoamericana Tower. Widely regarded as one of Mexico's leading contemporary artists, Leonardo Nierman creates works that challenge and inspire, drawing upon themes from the beauty of nature to the mysteries of the cosmos and beyond. Born in Mexico City in 1932 to immigrants from Eastern Europe, Leonardo Nierman's first artistic pursuits were focused on music, while academically he was drawn to the area of physical and mathematical sciences. As a young man, he realized that his dream of becoming a professional violinist was not to be. However, his musical studies provided him with a point upon which his artistic career would focus. "Music and painting are very much alike – both have tonalities, rhythms, high-intensity areas and resting areas," he says. "It was not until after I left music that I started to feel color." He went on to earn his bachelor's degree in physics and mathematics from the National University of Mexico in 1951, and for the next several years began to formulate his theories on light, color and form while honing his skills as a painter and sculptor. Since then, his art has employed a rich mixture of natural and cosmic forces, allusions to modern science, and, of course, music. His works – paintings, sculptures, textiles – are in major collections around the world, including the Vatican Gardens, the Albert Einstein Institute of New York, the Massachusetts Institute of Technology (MIT), the Kennedy Center in Washington D.C., Israel's Museum of Modern Art, the Museum of Modern Art in Mexico City, and Milwaukee's own Jewish Community Center. In 2002, his sculpture entitled "Flame of the Millenium" was installed at the Ohio Interchange along Chicago's Kennedy Expressway as part of the Chicago Gateway Green highway beautification project. Reaching 25 feet in height, this shining monument to hope and human aspirations is constructed of 25 tons of polished stainless steel. It is also a fitting monument to Nierman himself - a masterful and idealistic artist and philosopher. Wow! Look at that! I really, really, like this composition. A lot. Carraol! Nunca te han planteado hacer una exposición en tu ciudad? creo que triunfarías! tus fotos son verdaderas joyas!! Great capture and sweet processing! Your description was also very informative. Fenix, Dsole & Dee, thanks a lot for your words, its most appreciated. Dsole, te agradezco mucho tu comentario, pero creo me falta mucho camino por recorrer para pensar en esa posibilidad. Saludos.